Specialty chemicals firm Clariant is showcasing new polymer compounds which aims to limit, or eliminate, hydrolytic degradation at MD&M West. Hydrolytic degradation is known to affect certain materials commonly used in catheters. The Mevopur branded resins are being presented for the first time at the show. In polyether block amides (PEBA) and certain thermoplastic polyurethanes (TPU), adsorbed moisture can cause a breakdown of the polymer chains and reduce the mechanical properties, rendering ductile and tough materials brittle. This effect may be especially pronounced in resins with radiopaque fillers that make them visible to physicians and surgeons when exposed to X-rays. Even with careful pre-drying of the ingredients prior to compounding and tube extrusion, hydrolysis remains a risk. Moisture also can condense from the atmosphere, even inside foil-lined packaging, due to changes in temperature during transportation or storage. Tensile strength and elongation properties in standard test bars moulded from the test materials were similarly unaffected in Mevopur compounds, while the standard material shows significant degradation in these critical properties. The new modified PEBA and TPU polymers are manufactured at a dedicated facility in Lewiston Maine, and at two other sites in Malmo, Sweden, and Singapore. All three plants have been certified compliant with ISO13485-2016, the latest quality management system for medical devices. 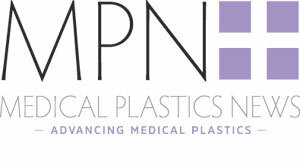 MD&M West is taking place until 7 February at Anaheim Convention Center, California.